The month of December is filled with excitement as we prepare to celebrate the holiday season with friends and family. As we consider our small slice of heaven here in Kernersville, we are reminded of memories past and also of future hopes. Looking around town you may realize that we have many new businesses settling down to call Kernersville home. We also have so many faithful, established businesses. Some of these are even celebrating over 80 years of fruitful labor in our community. Why don’t we make a point of popping by some of these businesses this month to congratulate them on a job well done? They surely deserve our patronage! Our businesses have been committed to the next generation as they reach for the stars. Many of these neighborhood companies have joined with our local technical schools, and they have been able to contribute to the ever-advancing curriculums and programs these schools offer. We are encouraged that there is a strong desire from our local students to learn a trade. They are now beginning to build upon those skills and are generating new career opportunities for the same town that supported them throughout their education. Kernersville companies appear to have a much higher calling than just profiting from our business because they are dedicated to making this town a wonderful place to labor and live. The phrase “work ready community” introduces a new and vibrant way of thinking. It defines the way our businesses support the people of Kernersville by training their employees to effectively meet each of our individual and corporate needs. Many of these employees have natural ability, but many also have studied and perfected their skills. We have the Work Ready Forsyth program to thank for linking workforce development with education. This team of local representatives is providing for the unmet labor needs of our local employers. We have a well-balanced community, and we are very fortunate to have businesses that are willing to train their employees to competently and effectively work for everyone’s mutual benefit. 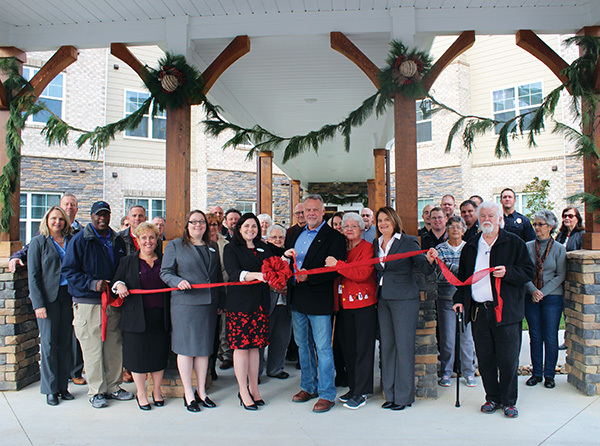 With 2,289 businesses in our town and many more on the horizon, Kernersville has officially become a popular destination. Let us all remember the businesses that have played a part in making our town what it is and join with them by supporting their commitment to our community this holiday season. Thank you for your continued passion and dedication to Kernersville and the Chamber. It is because of you that we are thriving!